Christmas comes early in Grapevine. The Christmas Capital of Texas® kicks off the Christmas Sale in July on Tuesday, July 11, 2017 at 10 a.m. Don’t miss-tletoe your chance to purchase tickets to some of the most anticipated events of the season. All aboard for Grapevine’s North Pole Express® presented by Great Wolf Lodge®. This beloved annual event features a magical excursion to the North Pole, traditional Christmas music, a photo with Santa, a “We Believe” silver bell from Mrs. Claus, a visit to Santa’s workshop and Santa’s very own Frosty Chocolate Snow Milk in a souvenir mug. Tickets for the North Pole Express are $25. Advance purchase is recommended as tickets sell out quickly. 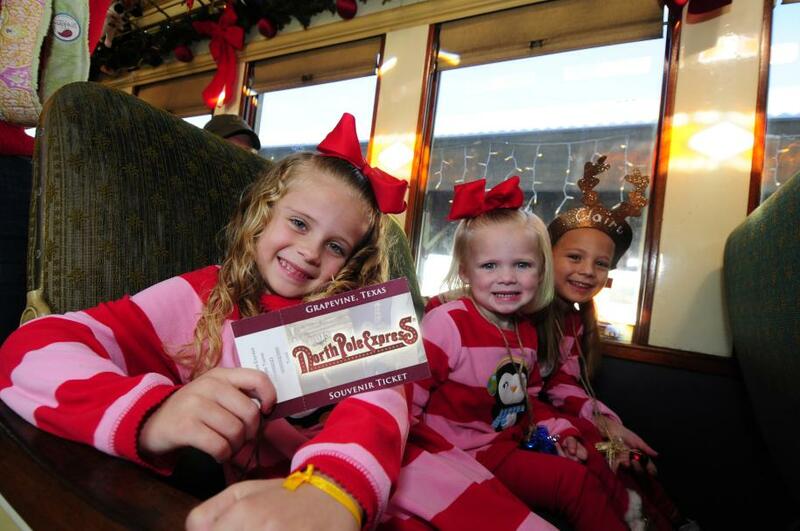 Dates for the North Pole Express are November 24, 25 and 26 and December 1, 2, 3, 8, 9, 10, 15, 16, 17, 18, 19, 20, 21, 22 and 23. Savor holiday cheer with Christmas Wine Trains. Sip and celebrate the holidays with wine from Grapevine’s Urban Wine Trail. On November 30 and December 14, the Christmas Wine Trains depart from and return to the Cotton Belt Railroad District. On December 7, the Christmas Wine Train departs from and returns to the Fort Worth Stockyards. All Christmas Wine Trains depart at 7 p.m.
“A Merry Little Christmas Show with Ricki Derek,” December 2, 8 p.m.
An “Elvis Christmas Classic” with Kraig Parker & the Royal Tribute Band, December 3, 4 p.m.
Rocky Gribble presents “A Grapevine Opry Christmas,” December 9, 7:30 p.m.
GENTRI: The Gentlemen Trio presents “Finding Christmas,” December 13, 14 and 16 at 7:30 p.m. and December 15 at 2 p.m. and 7:30 p.m. Forever Young presents “A Forever Young Christmas,” December 17 at 7:30 p.m. and December 18 at 2 p.m. and 7:30 p.m.
“A Christmas Carol,” December 1 at 7 p.m.
“A Christmas Story,” December 5 and 11 at 7 p.m.
“It’s A Wonderful Life,” December 6, 10, 19, 20, 21, and 23 at 7 p.m. and December 20 at 2 p.m.
“White Christmas,” December 8, 12 and 22 at 7 p.m. and December 19 and 21 at 2 p.m.
“A Charlie Brown Christmas” and “How the Grinch Stole Christmas” December 22 and 23 at 2 p.m.
Make your list and check it twice. &apos;Tis the season to be jolly, plan now and purchase your tickets beginning July 11, 2017 at 10 a.m. at tickets.grapevineticketline.com/events. Megan served as the Communications Coordinator for Visit Grapevine. A yoga and outdoors enthusiast, she enjoys spending time in nature and cannot live without Italian food. Fun Fact: Megan hopes to one day be a beekeeper and is currently working to learn the art of being an apiarist!